Nokia's stock price has been soaring over the past month after reports of sell-outs of their latest flagship device, the Lumia 920. TheNextWeb and WMPowerUser fanned these flames by estimating anywhere between 4-7 million Windows Phone sales so far this quarter (Oct-Nov), based on the Monthly Active Users (MAU) of Windows Phone's in-built Facebook application. Let's take a look at the veracity of these claims. Let me start out by stating that any sales estimate based on the usage statistics of an app is inherently flawed, but it is especially so in this case. For any new platform (even one that has faced adoption challenges), early sales are driven by enthusiasts and as the platform ages, the user demographics regress to the mean and hence, usage patterns change as well. This means that any attempt to estimate sales by assuming similar usage scenarios is incorrect. I have to credit TNW for picking up on this, but they still haven't taken it into account. But for the sake of argument, let's ignore the first major flaw, and look at their figures. The estimate is essentially based on one figure, i.e. 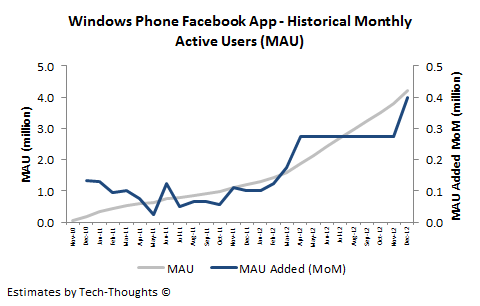 the ratio of Windows Phone device sales to the increase in Monthly Active Users (MAU) for the Facebook app. Instead of considering the average of this figure over time, the estimate assumes that a single data point from Q4 2011 (approx. 6.7 handsets sold per active user of the Windows Phone Facebook application") would be enough to estimate sales in Q4 2012. Their rationale for using that figure is that it correctly predicted Windows Phone sales in Q4 2010. In addition to this, the Windows Phone sales figure from Gartner that is used in the estimate includes sales of Windows Mobile. As we can see, while MAU shows a consistently rising trend, the "MAU added" pattern shows a considerable amount of noise, which means that individual data points are not as representative as the braoder trend. 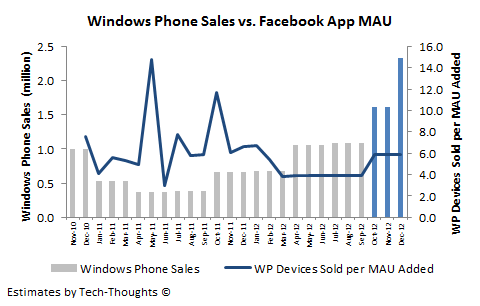 In addition to this, there is no consistent relationship established between Windows Phone sales and the increase in MAU. The period from March to November shows a normalized trend, i.e. assuming a consistent gain from 1.6 million MAU (in March) to 4.2 million MAU (in December). This shouldn't have an impact as the actual MAU and mean value of "MAU Added" remains the same. In the chart above, Windows Phone sales are based on Gartner's figures, after deducting an estimated proportion of Windows Mobile sales (as per Kantar's figures). 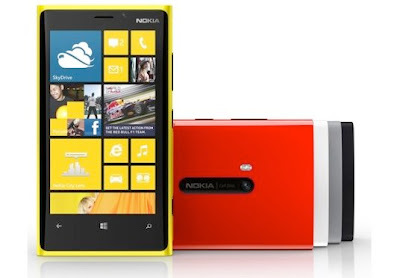 In Q4 2010, Windows Phone sales totaled 2 million while total sales of Microsoft smartphones totaled 3.44 million. This means that Windows Mobile comprised approximately 42% of Microsoft smartphone sales. Based on Kantar data, this number is estimated to have steadily decreased to 20% in Q3 2012. As we can see, the estimates show that Windows Phone sales totaled about 2-3 million so far, and may reach just 3-6 million by the end of Q4. 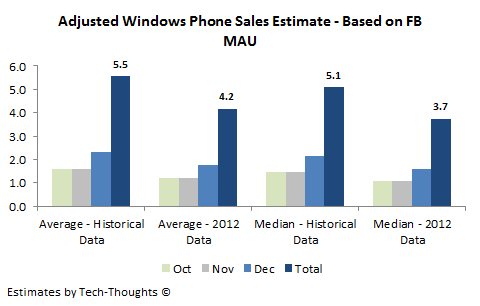 Please bear in mind that this is not my prediction of Windows Phone sales, as this is still a highly flawed approach. This just serves to highlight the large drop in the estimates if more realistic assumptions are made. Our checks indicate that retailers in Germany say they are only now beginning to receive the 920 across normal sales channels, and the volumes being received are still very small. We believe there is some initial pent-up demand that is resulting in stores selling out of initial shipments in a few days. Nevertheless, we believe this is largely to do with the low shipment volumes rather than surprisingly strong demand. We believe a somewhat similar dynamic is likely going on at AT&T for the 920. Based on the inventory on hand, we believe AT&T is selling only 10,000 to 15,000 Lumia 920 devices per week at the moment. We believe stores are able to sell available stock in a few days; however, we found most stores getting only a handful at a time. Despite press reports suggesting strong Lumia demand, our retail & industry research suggests limited supply and muted consumer interest in Nokia’s latest smartphones. On a global level, relative Google search interest appears to be only at levels similar to last year’s Lumia 800 launch. The comment about Google search interest seems trivial until we take a look at Google's research, which indicates that search interest has a strong correlation with smartphone sales. Limited initial supply was cited as the reason for early post-launch stock-outs at some carriers versus overwhelming demand. The inputs above lead me to believe that the Lumia 920 sell-outs are a factor of supply, rather than demand. Based on this, I don't believe that Windows Phone sales are particularly different from previous quarters, as the theme seems similar to the previous Lumia 900 launch. The news for Microsoft and Nokia isn't all bad, as Nokia was able to get the Lumia 920 on China's largest carrier, China Mobile. In addition to this, Microsoft was also able to forge an alliance in China Unicom. However, the problem is that smartphone sales in China are set to be driven by the sub-$200 segment, while the Lumia 620 (priced at $249) is the lowest priced Windows Phone 8 device available. If Nokia and Microsoft want to make Windows Phone a viable platform, they need to realize that developed markets are a lost cause and develop a niche in emerging markets before Firefox beats them to the punch. Did you see Ballmer's statement at the end of November that Windows Phones were selling 4 times faster than in 2011? Wasn't clear what time frame he was speaking about , but if we just assume November only, that would mean 2.4 million in the first month of availability of WP8. Consistent with your guesses. Good point, although I'd take Ballmer's comments with a pinch of salt. Microsoft typically only tracks Windows Phone OS sales to OEMs, which would equate to shipments. For popular platforms, there shouldn't be much difference between those two figures, but that's not necessarily true of Windows Phone. 2.4m per month is 7.2m per quarter as is widely expected. Thanks for confirming what we know. Where did you come up with that figure? The chart clearly shows that using this methodology, you can get at most 5.5 million. Multiplying November numbers by 3 is wrong-minded. 2.4 million would be sell-in in November only from Ballmer's comment. October would be prior to WP8 launch (and therefore much lower, presumably), and we have very little information on December (other than something like the Facebook metrics). That said, Nokia's 920T launch with China Mobile seems like a good catch. Probably good for 500 - 1000K units at launch. I have serious doubts about that. China has a fairly limited high end market. The early iPhone 5 sales are mostly to third party resellers, where the lumia 920 won't see much demand. The high end market in China is limited. And that 2.4 million figure for sell-in really has little basis. Nokia has hardly delivered the preorders yet. Currently we have phones outstanding which where ordered early november. They currently have an eta of medio January 2013. I think the Nokia 920 is just fine. I don't think Nokia has any shot at competing with Samsung. I'll cover some data about that in a future post. Nokia should be training their guns at the ZTEs and Huaweis of the world. I really look forward to reading your future posts then!